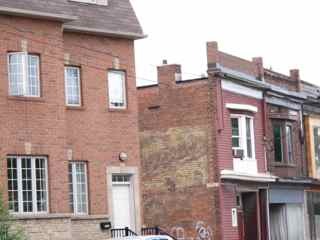 OK, my laundry was getting out of hand and I had a backlog of marking to do…so, yesterday’s adventure is rolled into today’s adventure which took me West on Dundas Street to Little Malta. 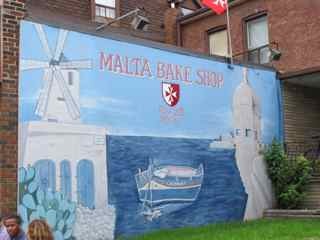 Between Keele St and Runnymede Road, it’s not so much a full neighbourhood anymore–most Maltese have moved to the burbs in Milton. In Toronto, or the GTA (Greater Toronto Area) Maltese number somewhere around 20 to 25,000. The real Malta is a tiny island to the south of Italy. Haven’t been, but am told it’s wonderful. 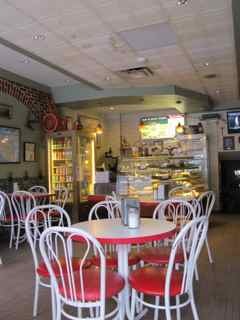 Biking along Dundas, Little Portugal is a smattering of salons, bakeries and mechanics. 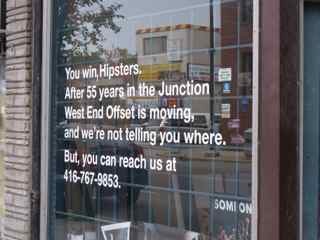 It’s old world meets gentrification and Hipster-ville. Upscale and trendy places are squeezing out the old style mom-and-pop shops. A hood called The Junction, just East of Little Malta, is seeing some of those changes. Some aren’t too happy. Biking out past some repair shops, I get the sense I’m going to hit the highway so I stop to ask for directions at a body shop. The slicked-haired mechanic has no idea. “What is a Malta?” Then, when I ask which way to Keele Street, they point in opposite directions. Yikes. I laugh and thank them. “Hey, you should know your neighbourhood!” I say riding away. Turns out it’s only one street over. The men are cut from the same cloth around here. 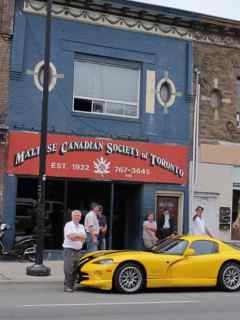 Hanging out front of the Maltese Association building, a mix of young and old men start to posture as I pull my camera out; an older one comes out, puts his hand on the shiny yellow car out front. “Take my picture. This is mine!” All the guys behind him are doubling over with laughter. But, the real reason I came: the bakery! Cash only, the short darked-haired woman, with crusts of make up in the corner of her eye, I told her I only has debit. “How much you have? The pastizzi are cheap,” referring to the famous Maltese party and reason why there’s a line up on Sundays after mass. “Oh no, don’t worry, I’ll go to an ATM and come back.” She was willing to take whatever cash I had. Sweet. Antoniette and her husband have been here for over 32 years.Little Malta used to be a booming place. Today the entire Maltese neighbourhood barely takes up an entire block. White metal chairs, Maltese souvenirs (wooden clocks) maps and newspaper stories are all over the walls. Outside the bathroom downstairs is a collage of regulars that have passed away. Reminds me of an open casket burial. Endearing but a little creepy. Now, to eat. 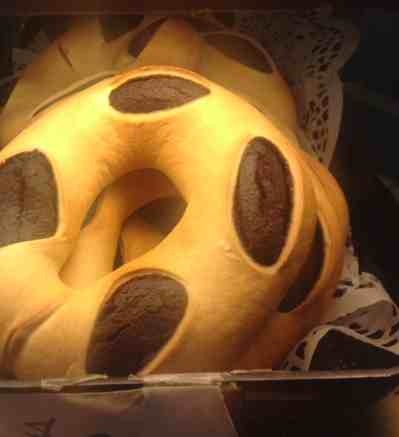 The display case was full of pastries I ‘ve never seen and this excited me: a dense chocolate bagel thing with nuts and fruit called qaghaq-ta-l’ghasel: “we have this at Christmas,” says Antoinette. Next, pastizzi is like a squished oily croissant. Stretched dough, the traditional filling is salty ricotta and mashed peas, or meat. I eat one with a cup of coffee served in a white ceramic dinner mug. Ate too fast to take picture. Testament to the yumminess of these little guys.